When it comes to rugby balls then Gilbert should be the first name on your team sheet. 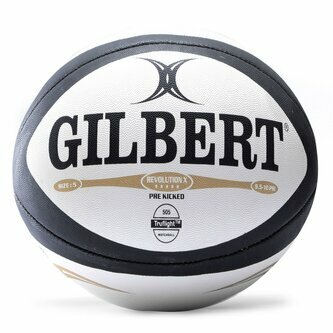 The Gilbert Revolution X Rugby Ball offers a high grade rubber surface and a patented truflight bladder, just the sort of high quality you would expect from this leading rugby brand. For the ultimate in performance, the Revolution X has been hand-stitched, pre-kicked and is an official size 5 rugby ball. A striking white and black design, with signature Gilbert branding, is ready for kick-off and to grace rugby fields around the world.